People choose a black and white photo that somehow relates to them or they relate to (no people, no explanation). They post it, and nominate someone else each day for seven days. There are variations on the theme but that is the general idea. You can check out the hashtags on both Twitter and Instagram to see examples. I am a sucker for creative challenges such as this. I appreciate the outlet and power of capturing meaning and the essence of myself or my life using a visual means. I love the connectedness it brings to friends and colleagues as we share bits of ourselves and relate to each other. I value the chance to catch a new glimpse inside the people we know; including the things that matter to them most, favourite places, coveted objects, special memories and the like. The educator in me jumps to the potential this simple exercise has for creating an innovative and enriching learning opportunity to do with students. It could serve as an excellent project to do with our learners exploring personal identity and could prompt thoughtful written reflections to go along with each picture. It could set the stage for rich dialogue and contextual conversations about posting on social media and using these platforms to put good out into the world. It could provide an opportunity to show our students that we care about them as individuals and that we are willing to meet them in “their space”, or digital platforms that they value and frequent. I challenge classroom teachers out there to try something along this theme with their learners. If you do, I look forward to hearing about it. If you already are…please share!! Many of you may be familiar with the powerful image featured below or one of its countless variations. Originally created by Craig Froehle, a business professor from Ohio back in 2012, the image has seen many, many iterations over the past five years. To read more about this graphic’s journey check out The Evolution of an Accidental Meme: How one little graphic became shared and adapted by millions. I am a person who often thinks “in metaphors”. After I came across the original image years ago, it stayed with me. When I was planning for my grade 5-8 ELA students or co-planning with teachers in my role as an inquiry support teacher the image often came back to me….What were the “crates” or scaffolds I would need to put in place for each of my students to ensure they each had equitable access to the learning we were doing? How could I differentiate the learning for my students to ensure everyone would find success? These supports took many different forms over the years including; reading materials at a variety of levels, assistive technologies such as voice to text programs, alternate assignments, student choice and much, much more. These supports looked like building trust, building on a students’ strengths, building connections and building relationships. These supports were always about discovering each individual learners’ needs and then discovering the best fit, adjustment or adaptation necessary to make each student most successful. In my current position, my role has shifted over the last number of years to work more closely with adult learners and the thinking and importance of finding the scaffolds necessary to meet the individual needs of learners to ensure equitable access to learning and success still rings true. When I recently came across this variation of the first image pictured above it struck a chord with me. The powerful notion of equity coupled with the beautiful image of growth and facing the sun seemed a perfect fit. Isn’t that what learning is? Continued growth? And isn’t that what we want for our students? To thrive and feel the warmth of the sun? In today’s context we know our contemporary learners are vastly different than previous generations. Our students are far more diverse, as are their needs. It is becoming more and more evident that as educators, we must change our focus and our approach in order to meet our students’ changing needs and the demands of our society. Merely differentiating programming to meet the needs of students is no longer enough and maintains a teacher-centric approach. In order to ensure equity and success for ALL students, we must also find space for a more learner-centric, personalized learning model in our classrooms and in our schools. (You can further explore this topic in a previous blog post entitled Paradigm Shift to Personalized Learning. ) Yet, as the role of teacher shifts and changes in many places from one of the owner of the knowledge to one of facilitator or coach, our learners have never needed us more. Our students need us to help them develop the skills, competencies and building blocks necessary to take responsibility for driving their own learning and thinking for themselves. They need us to offer opportunities to connect their individual interests, talents, passions, and aspirations to the learning they are doing in their classrooms. And they need us to guide them as they become active participants in moving their learning forward through questioning, deep thinking, reflection, and goal setting. Once again the amount of guidance students will need will vary from individual to individual. Some of our more independent self-starters may need less support. While others may need our help in modeling learning behaviours, asking the right questions, accessing the right resources, documenting their learning and planning for next steps. As with anything, personalized learning opportunities will vary from class to class, school to school and district to district. Finding the right balance between teacher directed instruction and student-driven learning will also vary depending on individual contexts external pressures and other variables. However, finding a place for students to direct their own learning in some fashion must become a priority in order to develop the problem solving, capable thinkers and autonomous learners today’s world requires. As the role of schools shifts and curricular reform spreads the pinnacle role of teacher remains the same; ensuring equitable opportunity for ALL students to learn, grow and find success, ultimately preparing them for the future. In doing so we can support all learners in finding their place in the sun. Week 6 IMMOOC Blog Prompt #1… give a shout out to 3 other blog posts that you have read from other participants. Love it! I have really appreciated reading the blog posts of fellow #IMMOOCers over the last number of weeks! Here are a few that have stood out for me. Listen. Let’s truly listen to our students; our colleagues who share a difference in opinions; our leaders who hold different viewpoints. Listen for understanding and discuss with patience and love. Ask questions. We can’t know what something is like without probing and pondering the scenarios of which we have had no experience. Ask questions and then actively listen to the responses. Identify biases. Provide opportunity to recognize biases that exist in ourselves and our students. Model and encourage self reflection as a way to confront these biases. In today’s context, it is essential that we create a culture that builds empathy in our classrooms and in all that we do. This “not so” secret ingredient is key to recognizing biases, giving us perspective and shaping our ability to truly understand the feelings of another. As Carolyn suggests, “let’s make building empathy in ourselves and others the focus of our work here on Earth. Doing so will create an environment where the other 7 innovative mindset characteristics can thrive”. I couldn’t agree more. We must remain committed to the cause, and vigilant in our pursuit of meaningful reflection. I have been thinking a lot about reflection as of late and considering why it is such a challenge for both students and educators. I truly appreciated the many metaphors Ashley used to unpack the forever shifting reality of reflection as well as its necessity. Lead, Learn,Grow- On a mission to share and inspire greatness in all of us. She makes this statement; “I created this to remind myself that just because adults or kids are good at something, does not necessarily mean that they are passionate about it.” This statement really resonated with me. Just because our students are good at something does not guarantee they are passionate about it. Just because our students demonstrate an aptitude or skill, does not mean they enjoy the process. For example, just because a student is a brilliant mathematician, does not necessarily translate into him or her wanting to spend countless hours doing more math formulas. For these students, their interests or passions may lie in something completely different or unrelated. Interesting…. now it seems so obvious, yet I hadn’t really thought about it in such simple terms before. Seeing it laid out in the matrix and later as the equation I made above, left me thinking. Supporting our students as they build skills, and strengths are essential but so is giving students the opportunity to explore their individual interests, and passions, keeping in mind all of these pieces may not, and possibly even should not always align. Thank you to Jullian for the visual reminder and thought provoking post. If you haven’t seen the video entitled The Tattooed, Skater Principal Making School Fun Again, it’s worth a watch. It was recently featured on Freethink which shares stories of people thinking differently and making a difference. Hamish Brewer, a tattooed, skateboarding principal in Northern Virginia isn’t your normal principal. Hamish is a born motivator, constantly calling on his students to “Be Relentless.” The New Zealander with an infectious energy served as principal of Occoquan Elementary, a school serving a large low-income and immigrant community. His unique leadership approach turned Occoquan from a struggling school with sagging test scores into one of the best schools in the state. Now, he’s in his first year at a new school, tasked with spearheading the same transformation he led at Occoquan. Can he replicate his remarkable success at Fred Lynn Middle School? Hamish Brewer is exciting to watch. His enthusiasm is contagious. His energy is unparalleled and the vision of change he brings to a school building and culture is inspiring. However, the reality is that every leader is NOT Hamish Brewer. Many principals may not possess his larger than life personality and comfort level in front of an audience on a mic. Some administrators may not have his easy way with the kids or huge sense of humour. Many will certainly not be skilled as on a skateboard or with a spray can of paint, as he is :). However, although those pieces have undeniably contributed to Hamish Brewer’s success in transforming the schools he leads, this is not what struck me most. What stood out for me was his relentless pursuit to do the best for kids in a quest for his school to be amazing. It was instead his relentless commitment to changing the game, and being an educational disruptor. And it was his relentless focus on changing the narrative of school, away from “archaic educational processes” towards making learning more authentic and relevant. The word relentless is one he uses regularly with students and it is a prominent fixture all over the walls of the school. In his book The Innovator’s Mindset, George Couros talks about “relentless restlessness”, a term suggested by Pixar’s Brad Bird as a phenomenon that serves to spread and sustain excellence in an organization. George suggests that it is this “relentless restlessness that will serve our students well and empower educators as learners”. We must be relentless in our pursuit of innovative teaching and learning that improves the lives of our students. Hamish Brewer’s relentless restlessness shines through in; his passionate devotion to innovation and the learners in his school, his commitment to the constant evolution of student learning, and ultimately his success as a leader. His innovative, creative approach to meeting the diverse needs of his students is to be commended, however it is his relentless vision and commitment which we must emulate. We look forward to hearing about Part Two of Hamish Brewer’s adventures as he moves on to Fred Lynn Middle School! The wise words above were written by my 14 year old daughter. She started high school this year and was so excited about beginning this new chapter. I have written about Sarah and her journey through school before, but summarizing it all in the big picture; school has always come easy for her, but in many ways, over the years, it has also left her under challenged and somewhat disengaged. Sarah thought high school was going to be different. You see, Sarah is a creative soul. She loves anything artistic in nature and has an amazing way with words. She is a thinker and a problem solver. She enjoys collaborating with people and enjoys public speaking. She is very globally minded. She embraces learning that encompasses these pieces. Sarah does love the culture of high school. She has made some lovely connections and new friends. She appreciates the offering of more clubs and experiences and is taking advantage of them. She welcomes the extended freedoms and opportunities. But she also thought, because of the nature of the program she is in, that she was going to see less worksheets, less videos, less lectures, less textbook assignments and less rote. She was looking forward to more project work, more discussions, more collaboration and more creative means to share her thinking and learning. Sarah thought high school was going to be different. So, to feed her creative soul, over the last couple of weeks she has started to drive some of her own learning outside of school. She is writing daily, based on prompts and ideas she has found online. She is reading a lot of poetry. She set up a blog, entitled Long Story Short, to share some of her past writing pieces and she is working on some new blog posts. She is finding her own way to colour outside the lines. IMMOOC- Week 3 Blog Prompt….What is one thing that you used to do in education that you no longer do or believe in? Why the change? Despite thinking about this prompt all week, I have been struggling to find the right reflective piece to blog about. However, on the eve of taking part in a highly anticipated day of learning with AJ Juliani tomorrow, it dawned on me. One thing that has changed so much for me over the last few years is how I engage as a professional learner. Becoming a NETWORKED, connected educator over the last number of years has been a game changer for me. In years past when attending professional learning sessions put on by colleagues or at conferences, I would take copious notes, capturing the content of the session, as well as the thoughts and connections I was making. In the end, I am not sure how effective or impactful those strategies were for me as learner. I don’t recall going back to all of those notes very often, as when I did I often found they hadn’t in the end really captured what I was looking for. Now, when I attend PD, I regularly use Twitter. I often capture some of my biggest takeaways in the form of a Tweet and using this platform I often engage with the presenter as well as other participants. This process is dynamic, engaging and furthers both collaboration and learning. If there is something a presenter says that really resonates with me, I capture it graphically as well, using something like Quote Creator etc. What often makes the PD and my entry points even richer yet, is the fact that I have often already made a connection to the presenter and his or her work either via Twitter or his or her blog etc. This too helps to enrich and extend the valuable learning I do as a participant. I can’t tell you how many times I have used the Twitter Advanced Search to seek out something I have Tweeted from a conference or presentation. I also use Storify to capture and archive a number of Tweets related to a presenter, conference or specific focus. For example after spending 4 days taking part in an amazing PD opportunity at the Learning Forward Conference in Vancouver last December, I captured many of my Tweets and those of others using Storify. Or I regularly created a Storify to celebrate all of the Tweeting and reflection that would happen in my school division, when George Couros came to work with our school division staff for a week at a time like seen here. The process of creating a Storify as well as having it as a resource to come back to over and over again is very powerful. I also often blog after taking part in valuable professional learning. Blogging helps me unpack my new learning in a deeper way. Reflecting on where I am at and where I am going is what pushes my thinking forward. Doing this in a public way makes me even more cognizant and accountable for my reflective practice. Similarly, I now do all of these exact same things when reading a professional book. Being a NETWORKED educator has immensely changed that process for the better as well. Having the ability to engage with an author while reading his or her work, using the means of Tweeting to converse with them, and reviewing their extended work online, extends my own learning once again. Blogging about this author’s work while reflecting and documenting my thinking helps me carve my own learning path or next steps moving forward. As a professional learner, shifting from my more PASSIVE STANCE of the past, to a position of being a much more connected, engaged member of a professional LEARNING NETWORK has been hugely impactful for me. Keeping in mind innovative shifts in education and the larger context, I will continue to embrace continued change, and growth as a learner, moving forward! My daughter Sarah is 13 and in grade 8. School has always come easy for her, but in many ways, over the years, it has also left her under challenged and somewhat disengaged. Sarah is highly creative and driven by somewhat random topics she is passionate about; urban exploration, Paris, cats, art, softball, music, media, photography, social justice and seeing the world. She is an avid reader who devours novels and entire series. She also loves writing and aspires to publish a book one day. She has an eye for photography, a knack for design, a dramatic flair and a passion for pottery. However, most of Sarah’s creative side and talents have in fact been developed outside of school. In The Innovator’s Mindset, written by George Couros, he refers to this concept as students learning and leading “in spite of school” and suggests the need for schools to ensure they are also empowering students to be innovators and creators “because of school” and as part of their school experience. From an early age, Sarah has often complained about being bored or disinterested in what school has to offer. She has often questioned the overall relevance of worksheets, workbooks, textbooks, tests, rote assignments and desk in rows. Don’t get me wrong; she is a stellar student and has always been very good at “studenting”, but she has often expressed frustration about what is actually happening within her classroom walls and its application to her future. How many Sarah’s sit in our classrooms feeling similarly? Sarah has flourished with teachers that honour her creative nature, strengths, interests, and talents by allowing time for student exploration and creation. In those settings, she excels and grows as a learner in many ways. Shouldn’t stimulated, thriving, engaged students be a norm in our schools and serve as the rule, as opposed to the exception? This week, I was reminded of the power and the potential for joy we offer our students when they are given the opportunity to express themselves in creative and meaningful ways, when I received an envelope in the mail from my daughter. In her Language Arts class, she was tasked with writing a letter to her “hero” and the teacher went the extra mile to send the letters in the mail to the recipients of these letters on behalf of her students. Sarah is a skilled, impassioned and eloquent writer, however, there have been limited times and few assignments offered to her over the years in her school experience, that have allowed her the opportunity to truly show her audience and herself, her true capacity as a writer. How many potential authors, artists, scientists, engineers, designers, and inventors sit waiting to be given opportunities to shine within our school system? How much talent is left untapped on our watch? So….I write this post as a reminder to all teachers of the importance of giving our students time to explore their passions, and their strengths when planning and programming. And I share this story as a reminder of the necessity to give our students thoughtful, self-directed, open-ended tasks that allow them to express themselves and explore their creative side. Our students need more regular opportunities to explore, create, learn and grow #becauseofschool. There are two billion mothers in the world. Trust me, I Googled it. So the odds that I would be blessed with you as my mom were pretty slim. But somehow, the stars aligned and I was lucky enough to become your daughter. Out of the two billion mothers in the world, I got you. And I am so, so thankful. I tried to imagine life without you, but then I realized there would be no life. Technically, I wouldn’t have been born, but that’s not what I’m talking about. What I mean is, without you, I would have no one to pour my heart out to, to speak my mind to and to share a laugh with. At my lowest low, you were there, comforting me and giving me a shoulder to cry on. And at my highest high, you are by my side, your hand in mine. You are my advice giver, “my person” and my rock. And without a rock, I would be completely and utterly lost. You have helped me find my way, find my meaning and find myself. There is a difference between a house and a home. A house has walls, windows, doors, and a staircase. But a home, a home can have a heartbeat. Home isn’t so much a place, but a person. You are my home. Your creativity inspires me every day and your ability to see the best in people makes me proud to be your daughter. You have taught me to value memories, knowledge, and love before material things and proved to me that I CAN do anything. You were my first friend, my best friend, and my forever friend. We have an unbreakable bond and our hearts are intertwined together forever. A year ago almost to the day, I wrote my first post on this blog, The Meaning of Meraki, shortly after being acquainted with the word itself. Fitting, that this month I received the necklace above from my family, who had it specially made for my birthday, recognizing what this word has come to mean to me. 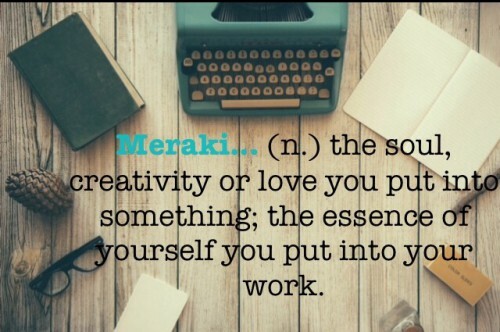 Meraki…the soul, creativity or love you put into something. The essence of yourself you put into your work. I am not sure I can truly explain or articulate my love affair with this word. It just is. I love what it means and what it stands for. I love the way it looks on a page. I love how it found its way to me. I love that it is of Greek origin and it is one of those words that has no direct translation in English. I love that since being introduced to it I have found many other fascinating untranslatable words, some examples you can read about here. I love that I think about it often. I love that I have witnessed what I deem as real life examples of the word’s essence in people who are obviously passionate about their jobs, their hobbies, and their life, which have included; artists, athletes, musicians, inventors, chefs, students, and educators I have encountered over the past year. It is a blessing and gift to find passion, joy, reward, and love in what we do and how we spend our time. This past weekend, I came across another great example of this in reading Shelley Moore’s book One Without the Other: Stories of Unity Through Diversity and Inclusion. This book is a must read for all educators. It explores how inclusive education can increase the learning and life chances of all students. After reading the book and looking further into some of Shelley’s work online, one thing that becomes quickly apparent is her strong experience base and her true passion for children and education. She is a master storyteller who appears to leave much of her heart and soul in all that she does. She has most certainly found her meraki, and through her work, shares her voice to inspire that in others. Imagine the possibilities if we organized our students by strengths instead of most schools’ traditional model of deficits. Imagine the possibilities if we supported our students in their quest to find their passions and fuel their interests. Imagine if schools were places that relentlessly sparked the inspiring artists, scientists, engineers, musicians, poets, designers, inventors and makers in our midst with regular opportunities for creation and exploration. Imagine the possibilities if we gave learners the opportunity to explore these interests using a student driven, personalized learning approach that honoured voice, choice, and autonomy. Imagine if innovative programs like High Tech High and inquiry/interest based initiatives like Genius Hour were the norm in our schools and not the exception. And imagine the possibilities if ultimately, as educators we served as guides in supporting our learners in finding their own sense of meraki. This week I received a gift; a beautiful piece of jewelry, envisioned by my 13-year-old daughter capturing a word, a concept really, that means a lot to me. However, the real potential gift is the realization of the meraki that lies within all of us. From time to time we see popular culture take an educational spin and translate into some sort of activity or practice in schools. However, I don’t ever recall an example quite as powerful as the escape room phenomenon and the classroom application known as Breakout EDU. Over the holidays, I spent some time getting acquainted with how Breakout EDU works using my own children and their friends as guinea pigs. They LOVED it! If you aren’t familiar with this learning opportunity here is a big picture explanation from the Breakout EDU website and the creators themselves, “Breakout EDU creates ultra-engaging learning games for people of all ages. Games (Breakouts) teach teamwork, problem-solving, critical thinking, and troubleshooting by presenting participants with challenges that ignite their natural drive to problem-solve. Breakouts are perfect for classrooms, staff trainings, dinner parties, and at home with the family! At the end of a Breakout, your players will be eager for the next! Speciality K-12 Breakouts can be used to teach core academic subjects including math, science, history, language arts and have embedded standards that apply problem-solving strategies within a real world OR collaborative context. We live in a dynamic, rapidly changing world. As educators, we constantly must strive to meet the unique and unprecedented learning needs of our students in the midst of these changing times. In 2015, The Economist Intelligence Unit (the world leader in global business intelligence) completed a study focusing on preparing our students for the future, and what skills that reality will demand. After surveying respondents from countless industries, business sectors and fields of education from countries around the world, the study showed that organizations felt the top five critical skills for employees today are: problem-solving, teamwork, communication, critical thinking and creativity. Over the past two years, I have been working with teachers, and ultimately students, in my school division in Winnipeg, to support the development of these 21st-century skills. One of the most successful strategies teachers have found and embraced in supporting learning in this area is through the use of Instant Challenges. This term comes from a program called Destination Imagination, which is a challenge program in which students learn and experience the creative process while fostering their creativity, curiosity and courage. The purpose of an instant challenge is to put a team of students and their collaborative problem-solving abilities, creativity, and teamwork to the test in a short, time-driven situation. The challenges are either task or performance based and have teams involved in doing anything from building a structure, to designing a catapult, to performing an infomercial for a new ice cream flavour they invented, to creating a new constellation and sharing a skit about how it got its name. Through this challenge based learning, teams must plan collaboratively, assess the use of available materials, apply strong time management skills, often utilize performance abilities, and work well as a team, under tight time constraints. Instant challenges have been embraced by the educators I work with. Classroom teachers are using them across grade levels, and throughout the disciplines. Adult learners are taking part in them regularly at staff meetings and professional learning days. Educators see the true value these motivating activities offer their students related to critical thinking, creativity, collaboration, communication, risk-taking and building resilience. Check out this document for further explanation and resources around Instant Challenges. So what’s the connection to Breakout EDU? The way I see it, this approach to learning uses a similar skillset and methodology to Instant Challenges in an engaging, dynamic and extremely fun way. Students work together to crack codes, solve problems, decipher locks, untangle riddles, think critically and collaborate to “breakout” (in reality they are actually “breaking in” to the box but you get the idea). Teachers can find ready made, Breakout scenarios online linked to many curricular areas and outcomes, or create their own to meet their students’ needs and interests. A next step could also be to offer students the enriching opportunity to create their own Breakout EDU challenges for their classmates to solve. Educators can purchase a ready to go Breakout EDU kit here, complete with the lockable boxes, hasp, hint cards, invisible ink pen, UV flashlight and a variety of locks. This purchase also gives teachers access to a code and all of Breakout’s ready made scenarios and resources. Some schools are choosing to create their own similar kits by purchasing the locks and other materials online through companies such as Amazon or at local hardware stores. Educators can also find hundreds of Breakout EDU related resources on platforms such as Pinterest. And check out this teacher created resource from Lynne Herr explaining how to run Breakout EDU with one box for a whole class. The possibilities are endless! In addition to supporting and developing 21st Century skills and competencies in students, Breakout EDU can also involve solving math problems in context. It uses reading, writing, and word study in meaningful, hands-on ways. It promotes students asking questions and investigating answers to knowledge and content related outcomes in motivating, relevant situations. Breakout uses an integrated, multidisciplinary approach through which all students can find an entry point. Kids love a challenge. They enjoy finding answers to difficult questions and riddles. They relish in a good mystery and they embrace the idea of the “hunt”. Breakout EDU checks all of these boxes as a learning opportunity and authentically engages students in their learning. As educators, we are constantly searching for innovative and appealing ways to motivate our students. Here is an opportunity to breakout and try something new and exciting! In early December, I had the privilege of attending the Learning Forward Conference in beautiful British Columbia. This was my first experience at this learning association’s international conference and it did not disappoint. With the stunning backdrop of the Coast mountains, waterfront area and downtown Vancouver skyline, educators from across Canada, the US and international representatives came together to share, collaborate and learn. Find below some highlights of the rich connections I made in sessions throughout the week. For a further glimpse into my learning for the week visit this Storify. Spirals of Inquiry has been on my radar over the past year, but spending time with its creators looking strategically at how schools can take this collaborative, inquiry-oriented, evidence-based approach to teaching and learning was very beneficial. We looked closely at the concept of HARD goals to centralize our focus, as well as grounding inquiry in the key principles that shape deep, meaningful learning including the First Peoples Principles of Learning, and the OECD Nature of Learning- 7 Principles of Learning. What’s going on for our learners? Why does this matter? . The Spirals of Inquiry framework has the potential to be a hugely impactful resource in helping educators to determine strategies for shifting thinking and practice within schools while developing a sense of collective and collaborative professional agency. A second session, I attended related to this work (Inquiring Professionals: Activating Learning and Changing Lives) involved numerous BC public school districts sharing their experiences along the following question: “In what ways do district strategic initiatives in inquiry based learning act as catalysts for moving learning forward and enhancing student success?” The practical stories, examples and overall learning journeys shared by these many districts helped to anchor and ground the collaborative professional inquiry work within many real and meaningful contexts. For further examples of how the Spirals of Inquiry and Networks of Inquiry and Innovation support collaborative professional inquiry visit these case studies. For a more in depth look at the findings of the study and how to promote the tenets of quality professional learning in individual school contexts visit the full report here. As a follow up to the findings and as a response for a need for support in these areas, Michael Fullan and Andy Hargreaves, who keynoted at the conference offered a “Call to Action: Bringing the Profession Back In” .In this call to action, building on the Canada study, Fullan and Hargreaves outline an argument for meaningful professional learning and development. They use the following questions to guide their insights and recommendations around professional learning and development (PLD). What is the essence of PLD? Why do advocates keep making a flawed case for PLD? How are critics making a misdirected case against PLD? What’s the symbiosis (mutual benefit) between students and their teachers in terms of their learning, well-being, and development? How do we understand and underscore the importance of the individual and the collective aspects of PLD? How do we build a culture of professional capital — our call to action? They conclude with actions for teachers, systems, and Canada to take to establish a culture of collaborative professionalism. One of the major shifts in teacher thinking and facilitating during these, “between the desks” teaching and learning opportunities is changing the focus from answering questions to asking deep, rich questions, as well as being more thoughtful in planning key questions ahead of time. Another interesting session of note was one entitled, Hacking Leadership: A Disturbing Guide facilitated by Antonia Issa Lahera and Kendall Zoller. This full day session examined the many dimensions of leadership, considering implications for both the heart and mind, as well as what role relationships, values and beliefs play in both leadership and implementing change. It looked to supporting a process for creating innovations within any organization by gaining a foundation in communicative intelligence and adaptivity so that people within any educational realm can lead and grow. Orchestrate conflict- the goal is not to have conflict, but it is a reality when we are challenging values and beliefs. How can we be mindful in the heat of the moment? How can we use strategies like “third point” to reach our goals? Hold steady- what is it that you believe in that you are prepared to stand firm on and not waver from? what happens when values conflict? We also looked closely at DThinking from the Institute of Design at Stanford. This design thinking process is a step by step, interdisciplinary approach to problem solving, that begins with the lens of empathizing, and can be used to approach a myriad of challenges. We explored the importance of having “communicative intelligence”, and establishing rapport before anything else with people. We also examined the 7 Essential Abilities of Effective Presenters. The session was dynamic, and layered, as is effective leadership. It offered many and varied perspectives around the forces, processes and considerations necessary in leading innovation and change. These words from the presenters summarize it best…. The final and powerful keynote to the conference was by Denise Augustine, a District Principal of Aboriginal Education from the Cowichan Valley in BC. Denise shared stories from her family including her grandmother’s struggles in residential schools and her own journey as a learner and educator. She invited us to imagine an education system that values diversity, inspires innovation and embraces success and achievement for ALL learners. Denise discussed how in order for there to be a transformation in education we must recognize the gifts each learner brings, and nurture those gifts. We must know the assumptions and biases we hold with us and learn from each other. We must make space for our educators to show up with passion, love, and a drive to continue to improve education for all children. And we must empower each one of the learners in our care to become collaborative, creative, courageous, critically thinking, problem solvers. It was a wonderful ending to an amazing, enriching week of learning!